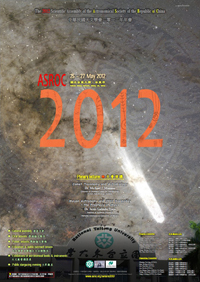 The Astronomical Society cordially invites you to participate in the 2012 Scientific Assembly of the Astronomical Society of the Republic of China (ASROC2012) to be held at National Taitung University on May 25 - 27, 2012. This is the annual event for all astronomers and astrophysicists in Taiwan to demonstrate their most recent discoveries and observations, to report their latest research results and to exchange ideas as well as to organize collaborations. In this year’s meeting, there will be the general assembly meeting, two plenary talks, scientific and educational sessions, as well as poster presentation. The plenary talks feature Dr. Michael Mumma, Director of the Goddard Center for Astrobiology at NASA Astrobiology Institute, on "Messengers from the Early Solar System - The Similarity and Diversity of Comets", and Dr. Jesus Galindo Trejo, a senior research fellow at the Institute of Aesthetic Research at National Autonomous University of Mexico, on "Mayan Apocalypse in 2012? A critical view from the Mesoamerican astronomy and culture". All contributions in the meeting, including oral talks and poster presentations, will be published in the Journal of Taipei Astronomical Museum. Best poster awards will also be granted. In addition to the scientific agenda, the meeting will organize a group tour in the afternoon of May 26 (Sat). A conference banquet and a sky gazing event will later be held in the same evening. During the meeting, book and instrumentation exhibition are also expected. Given the remote location of the meeting, the organizing committee will help making group reservations for the round-trip train tickets between Taipei and Taitung. For those who would like to enjoy our service, please do complete the registration before the early registration deadline (March 23). People who register after 2012 March 23 will need to make their own travel arrangements. Participants with contributions should submit their abstracts online by April 27. Copyright © 2012 ASROC. All Rights Reserved. Best view in 1024 x 768 screen resolution.